"The Forms" redirects here. For the band, see The Forms (band). The theory of Forms or theory of Ideas is a philosophical theory, concept, or world-view, attributed to Plato, that the physical world is not as real or true as timeless, absolute, unchangeable ideas. According to this theory, ideas in this sense, often capitalized and translated as "Ideas" or "Forms", are the non-physical essences of all things, of which objects and matter in the physical world are merely imitations. Plato speaks of these entities only through the characters (primarily Socrates) of his dialogues who sometimes suggest that these Forms are the only objects of study that can provide knowledge. The theory itself is contested from within Plato's dialogues, and it is a general point of controversy in philosophy. Whether the theory represents Plato's own views is held in doubt by modern scholarship. However, the theory is considered a classical solution to the problem of universals. The early Greek concept of form precedes attested philosophical usage and is represented by a number of words mainly having to do with vision, sight, and appearance. Plato uses these aspects of sight and appearance from the early Greek concept of the form in his dialogues to explain the Forms and the Good. The meaning of the term εἶδος (eidos), "visible form", and related terms μορφή (morphē), "shape", and φαινόμενα (phainomena), "appearances", from φαίνω (phainō), "shine", Indo-European *bʰeh₂- or *bhā- remained stable over the centuries until the beginning of philosophy, when they became equivocal, acquiring additional specialized philosophic meanings. The pre-Socratic philosophers, starting with Thales, noted that appearances change, and began to ask what the thing that changes "really" is. The answer was substance, which stands under the changes and is the actually existing thing being seen. The status of appearances now came into question. What is the form really and how is that related to substance? The Forms are expounded upon in Plato's dialogues and general speech, in that every object or quality in reality has a form: dogs, human beings, mountains, colors, courage, love, and goodness. Form answers the question, "What is that?" Plato was going a step further and asking what Form itself is. He supposed that the object was essentially or "really" the Form and that the phenomena were mere shadows mimicking the Form; that is, momentary portrayals of the Form under different circumstances. The problem of universals – how can one thing in general be many things in particular – was solved by presuming that Form was a distinct singular thing but caused plural representations of itself in particular objects. For example, in the dialogue Parmenides, Socrates states: "Nor, again, if a person were to show that all is one by partaking of one, and at the same time many by partaking of many, would that be very astonishing. But if he were to show me that the absolute one was many, or the absolute many one, I should be truly amazed. ":p129 Matter is considered particular in itself. For Plato, forms, such as beauty, are more real than any objects that imitate them. Though the forms are timeless and unchanging, physical things are in a constant change of existence. Where forms are unqualified perfection, physical things are qualified and conditioned. These Forms are the essences of various objects: they are that without which a thing would not be the kind of thing it is. For example, there are countless tables in the world but the Form of tableness is at the core; it is the essence of all of them. Plato's Socrates held that the world of Forms is transcendent to our own world (the world of substances) and also is the essential basis of reality. Super-ordinate to matter, Forms are the most pure of all things. Furthermore, he believed that true knowledge/intelligence is the ability to grasp the world of Forms with one's mind. A Form is aspatial (transcendent to space) and atemporal (transcendent to time). Atemporal means that it does not exist within any time period, rather it provides the formal basis for time. It therefore formally grounds beginning, persisting and ending. It is neither eternal in the sense of existing forever, nor mortal, of limited duration. It exists transcendent to time altogether. Forms are aspatial in that they have no spatial dimensions, and thus no orientation in space, nor do they even (like the point) have a location. They are non-physical, but they are not in the mind. Forms are extra-mental (i.e. real in the strictest sense of the word). A Form is an objective "blueprint" of perfection. The Forms are perfect and unchanging representations of objects and qualities. For example the Form of beauty or the Form of a triangle. For the form of a triangle say there is a triangle drawn on a blackboard. A triangle is a polygon with 3 sides. The triangle as it is on the blackboard is far from perfect. However, it is only the intelligibility of the Form "triangle" that allows us to know the drawing on the chalkboard is a triangle, and the Form "triangle" is perfect and unchanging. It is exactly the same whenever anyone chooses to consider it; however, time only effects the observer and not of the triangle. It follows that the same attributes would exist for the Form of beauty and for all Forms. The words, εἶδος (eidos) and ἰδέα (idea) come from the Indo-European root *weyd- or *weid- "see" (cognate with Sanskrit vétti). Eidos (though not idea) is already attested in texts of the Homeric era, the earliest Greek literature. This transliteration and the translation tradition of German and Latin lead to the expression "theory of Ideas." The word is however not the English "idea," which is a mental concept only. The theory of matter and form (today's hylomorphism) started with Plato and possibly germinal in some of the presocratic writings. The forms were considered as being "in" something else, which Plato called nature (physis). The latter seemed as carved "wood", ὕλη (hyle) in Greek, corresponding to materia in Latin, from which the English word "matter" is derived, shaped by receiving (or exchanging) forms. In the Allegory of the Cave, the objects that are seen are not real, according to Plato, but literally mimic the real Forms. The objects that are seen, according to Plato, are not real, but literally mimic the real Forms. In the Allegory of the Cave expressed in Republic, the things that are ordinarily perceived in the world are characterized as shadows of the real things, which are not perceived directly. That which the observer understands when he views the world mimics the archetypes of the many types and properties (that is, of universals) of things observed. Plato often invokes, particularly in his dialogues Phaedo, Republic and Phaedrus, poetic language to illustrate the mode in which the Forms are said to exist. Near the end of the Phaedo, for example, Plato describes the world of Forms as a pristine region of the physical universe located above the surface of the Earth (Phd. 109a-111c). In the Phaedrus the Forms are in a "place beyond heaven" (huperouranios topos) (Phdr. 247c ff); and in the Republic the sensible world is contrasted with the intelligible realm (noēton topon) in the famous Allegory of the Cave. It would be a mistake to take Plato's imagery as positing the intelligible world as a literal physical space apart from this one. Plato emphasizes that the Forms are not beings that extend in space (or time), but subsist apart from any physical space whatsoever. Thus we read in the Symposium of the Form of Beauty: "It is not anywhere in another thing, as in an animal, or in earth, or in heaven, or in anything else, but itself by itself with itself," (211b). And in the Timaeus Plato writes: "Since these things are so, we must agree that that which keeps its own form unchangingly, which has not been brought into being and is not destroyed, which neither receives into itself anything else from anywhere else, nor itself enters into anything anywhere, is one thing," (52a, emphasis added). According to Plato, Socrates postulated a world of ideal Forms, which he admitted were impossible to know. Nevertheless, he formulated a very specific description of that world, which did not match his metaphysical principles. Corresponding to the world of Forms is our world, that of the shadows, an imitation of the real one. Just as shadows exist only because of the light of a fire, our world exists as, "the offspring of the good". Our world is modeled after the patterns of the Forms. The function of humans in our world is therefore to imitate the ideal world as much as possible which, importantly, includes imitating the good, i.e. acting morally. Plato lays out much of this theory in the "Republic" where, in an attempt to define Justice, he considers many topics including the constitution of the ideal state. While this state, and the Forms, do not exist on earth, because their imitations do, Plato says we are able to form certain well-founded opinions about them, through a theory called recollection. Our aim in founding the state was not the disproportional happiness of any one class, but the greatest happiness of the whole; we thought that in a state ordered with a view to the good of the whole we should be most likely to find justice. The key to not know how such a state might come into existence is the word "founding" (oikidzomen), which is used of colonization. [clarification needed] It was customary in such instances to receive a constitution from an elected or appointed lawgiver; however in Athens, lawgivers were appointed to reform the constitution from time to time (for example, Draco, Solon). In speaking of reform, Socrates uses the word "purge" (diakathairountes) in the same sense that Forms exist purged of matter. The purged society is a regulated one presided over by philosophers educated by the state, who maintain three non-hereditary classes as required: the tradesmen (including merchants and professionals), the guardians (militia and police) and the philosophers (legislators, administrators and the philosopher-king). Class is assigned at the end of education, when the state institutes individuals in their occupation. Socrates expects class to be hereditary but he allows for mobility according to natural ability. The criteria for selection by the academics is ability to perceive forms (the analog of English "intelligence") and martial spirit as well as predisposition or aptitude. The views of Socrates on the proper order of society are certainly contrary to Athenian values of the time and must have produced a shock effect, intentional or not, accounting for the animosity against him. For example, reproduction is much too important to be left in the hands of untrained individuals: "... the possession of women and the procreation of children ... will ... follow the general principle that friends have all things in common, ...." The family is therefore to be abolished and the children – whatever their parentage – to be raised by the appointed mentors of the state. Their genetic fitness is to be monitored by the physicians: "... he (Asclepius, a culture hero) did not want to lengthen out good-for-nothing lives, or have weak fathers begetting weaker sons – if a man was not able to live in the ordinary way he had no business to cure him ...." Physicians minister to the healthy rather than cure the sick: "... (Physicians) will minister to better natures, giving health both of soul and of body; but those who are diseased in their bodies they will leave to die, and the corrupt and incurable souls they will put an end to themselves." Nothing at all in Greek medicine so far as can be known supports the airy (in the Athenian view) propositions of Socrates. Yet it is hard to be sure of Socrates' real views considering that there are no works written by Socrates himself. There are two common ideas pertaining to the beliefs and character of Socrates: the first being the Mouthpiece Theory where writers use Socrates in dialogue as a mouthpiece to get their own views across. However, since most of what we know about Socrates comes from plays, most of the Platonic plays are accepted as the more accurate Socrates since Plato was a direct student of Socrates. 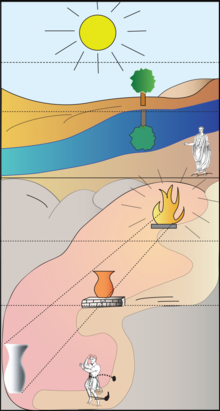 Plato's conception of Forms actually differs from dialogue to dialogue, and in certain respects it is never fully explained, so many aspects of the theory are open to interpretation. Forms are first introduced in the Phaedo, but in that dialogue the concept is simply referred to as something the participants are already familiar with, and the theory itself is not developed. Similarly, in the Republic, Plato relies on the concept of Forms as the basis of many of his arguments but feels no need to argue for the validity of the theory itself or to explain precisely what Forms are. Commentators have been left with the task of explaining what Forms are and how visible objects participate in them, and there has been no shortage of disagreement. Some scholars advance the view that Forms are paradigms, perfect examples on which the imperfect world is modeled. Others interpret Forms as universals, so that the Form of Beauty, for example, is that quality that all beautiful things share. Yet others interpret Forms as "stuffs," the conglomeration of all instances of a quality in the visible world. Under this interpretation, we could say there is a little beauty in one person, a little beauty in another—all the beauty in the world put together is the Form of Beauty. Plato himself was aware of the ambiguities and inconsistencies in his Theory of Forms, as is evident from the incisive criticism he makes of his own theory in the Parmenides. Plato believed that long before our bodies ever existed, our souls existed and inhabited heaven, where they became directly acquainted with the forms themselves. Real knowledge, to him, was knowledge of the forms. But knowledge of the forms cannot be gained through sensory experience because the forms are not in the physical world. Therefore, our real knowledge of the forms must be the memory of our initial acquaintance with the forms in heaven. Therefore, what we seem to learn is in fact just remembering. Plato was well aware of the limitations of the theory, as he offered his own criticisms of it in his dialogue Parmenides. There Socrates is portrayed as a young philosopher acting as junior counterfoil to aged Parmenides. To a certain extent it is tongue-in-cheek as the older Socrates will have solutions to some of the problems that are made to puzzle the younger. The dialogue does present a very real difficulty with the Theory of Forms, which Plato most likely only viewed as problems for later thought. These criticisms were later emphasized by Aristotle in rejecting an independently existing world of Forms. It is worth noting that Aristotle was a pupil and then a junior colleague of Plato; it is entirely possible that the presentation of Parmenides "sets up" for Aristotle; that is, they agreed to disagree. But exactly how is a Form like the day in being everywhere at once? The solution calls for a distinct form, in which the particular instances, which are not identical to the form, participate; i.e., the form is shared out somehow like the day to many places. The concept of "participate", represented in Greek by more than one word, is as obscure in Greek as it is in English. Plato hypothesized that distinctness meant existence as an independent being, thus opening himself to the famous third man argument of Parmenides, which proves that forms cannot independently exist and be participated. If universal and particulars – say man or greatness – all exist and are the same then the Form is not one but is multiple. If they are only like each other then they contain a form that is the same and others that are different. Thus if we presume that the Form and a particular are alike then there must be another, or third Form, man or greatness by possession of which they are alike. An infinite regression would then result; that is, an endless series of third men. The ultimate participant, greatness, rendering the entire series great, is missing. Moreover, any Form is not unitary but is composed of infinite parts, none of which is the proper Form. Socrates' later answer would be that men already know the Forms because they were in the world of Forms before birth. The mimes only recall these Forms to memory. The comedian Aristophanes wrote a play, The Clouds, poking fun of Socrates with his head in the clouds. The central image from Raphael's The School of Athens (1509-1511), depicting Plato (left) and Aristotle (right). 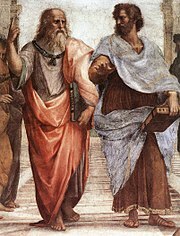 Plato is depicted pointing upwards, in reference to his belief in the higher Forms, while Aristotle disagrees and points downwards to the here-and-now, in reference to his belief in empiricism. The topic of Aristotle's criticism of Plato's Theory of Forms is a large one and continues to expand. Rather than quote Plato, Aristotle often summarized. Classical commentaries thus recommended Aristotle as an introduction to Plato. As a historian of prior thought, Aristotle was invaluable, however this was secondary to his own dialectic and in some cases he treats purported implications as if Plato had actually mentioned them, or even defended them. In examining Aristotle's criticism of The Forms, it is helpful to understand Aristotle's own hylomorphic forms, by which he intends to salvage much of Plato's theory. In the summary passage quoted above Plato distinguishes between real and non-real "existing things", where the latter term is used of substance. The figures that the artificer places in the gold are not substance, but gold is. Aristotle stated that, for Plato, all things studied by the sciences have Form and asserted that Plato considered only substance to have Form. Uncharitably, this leads him to something like a contradiction: Forms existing as the objects of science, but not-existing as non-substance. Scottish philosopher W.D. Ross objects to this as a mischaracterization of Plato. Plato did not claim to know where the line between Form and non-Form is to be drawn. As Cornford points out, those things about which the young Socrates (and Plato) asserted "I have often been puzzled about these things" (in reference to Man, Fire and Water), appear as Forms in later works. However, others do not, such as Hair, Mud, Dirt. Of these, Socrates is made to assert, "it would be too absurd to suppose that they have a Form." Ross also objects to Aristotle's criticism that Form Otherness accounts for the differences between Forms and purportedly leads to contradictory forms: the Not-tall, the Not-beautiful, etc. That particulars participate in a Form is for Aristotle much too vague to permit analysis. By one way in which he unpacks the concept, the Forms would cease to be of one essence due to any multiple participation. As Ross indicates, Plato didn't make that leap from "A is not B" to "A is Not-B." Otherness would only apply to its own particulars and not to those of other Forms. For example, there is no Form Not-Greek, only particulars of Form Otherness that somehow suppress Form Greek. Regardless of whether Socrates meant the particulars of Otherness yield Not-Greek, Not-tall, Not-beautiful, etc., the particulars would operate specifically rather than generally, each somehow yielding only one exclusion. Plato had postulated that we know Forms through a remembrance of the soul's past lives and Aristotle's arguments against this treatment of epistemology are compelling. For Plato, particulars somehow do not exist, and, on the face of it, "that which is non-existent cannot be known". See Metaphysics III 3–4. 439–440: The problem of knowing the Forms. 210–211: The archetype of Beauty. 73–80: The theory of recollection restated as knowledge of the Forms in soul before birth in the body. 109–111: The myth of the afterlife. 402–403: Education the pursuit of the Forms. 472–483: Philosophy the love of the Forms. The philosopher-king must rule. 500–517: Philosopher-guardians as students of the Beautiful and Just implement archetypical order. Metaphor of the Sun: The sun is to sight as Good is to understanding. Allegory of the Cave: The struggle to understand forms like men in cave guessing at shadows in firelight. 589–599: The ideal state and its citizens. Extensive treatise covering citizenship, government and society with suggestions for laws imitating the Good, the True, the Just, etc. 265–266: The unity problem in thought and nature. 129–135: Participatory solution of unity problem. Things partake of archetypal like and unlike, one and many, etc. The nature of the participation (Third man argument). Forms not actually in the thing. The problem of their unknowability. 184–186: Universals understood by mind and not perceived by senses. 246–248: True essence a Form. Effective solution to participation problem. 251–259: The problem with being as a Form; if it is participatory then non-being must exist and be being. 27–52: The design of the universe, including numbers and physics. Some of its patterns. Definition of matter. 14-18: Unity problem: one and many, parts and whole. 342–345: The epistemology of Forms. The Seventh Letter is possibly spurious. ^ Modern English textbooks and translations prefer "theory of Form" to "theory of Ideas", but the latter has a long and respect tradition starting with Cicero and continuing in German philosophy until present, and some English philosophers prefer this in English too. See W. D. Ross, Plato's Theory of Ideas (1951). ^ The name of this aspect of Plato's thought is not modern and has not been extracted from certain dialogues by modern scholars. However, it is attributed to Plato without any direct textual evidence that Plato himself holds the views of the speakers of the dialogues. The term was used at least as early as Diogenes Laërtius, who called it (Plato's) "Theory of Ideas:" Πλάτων ἐν τῇ περὶ τῶν ἰδεῶν ὑπολήψει..., "Plato". Lives of Eminent Philosophers. Book III. p. Paragraph 15. ^ Plato uses many different words for what is traditionally called form in English translations and idea in German and Latin translations (Cicero). These include idéa, morphē, eîdos, and parádeigma, but also génos, phýsis, and ousía. He also uses expressions such as to x auto, "the x itself" or kath' auto "in itself". See Christian Schäfer: Idee/Form/Gestalt/Wesen, in Platon-Lexikon, Darmstadt 2007, p. 157. ^ Forms (usually given a capital F) were properties or essences of things, treated as non-material abstract, but substantial, entities. They were eternal, changeless, supremely real, and independent of ordinary objects that had their being and properties by 'participating' in them. ^ "Chapter 28: Form" of The Great Ideas: A Synopticon of Great Books of the Western World (Vol. II). Encyclopædia Britannica (1952), p. 526–542. This source states that Form or Idea get capitalized according to this convention when they refer "to that which is separate from the characteristics of material things and from the ideas in our mind." ^ Possibly cognate with Sanskrit bráhman. See Thieme (1952): Bráhman, ZDMG, vol. 102, p. 128. "ZDMG online". .
^ "*bhā-". American Heritage Dictionary: Fourth Edition: Appendix I. 2000. ^ Kidder, D. S. and Oppenheim, N. D. (2006), The Intellectual Devotional, p27, Borders Group, Inc, Ann Arbor, ISBN 978-1-60961-205-4. ^ Cratylus 389: "For neither does every smith, although he may be making the same instrument for the same purpose, make them all of the same iron. The form must be the same, but the material may vary ...."
^ For example, Theaetetus 185d–e: "...the mind in itself is its own instrument for contemplating the common terms that apply to everything." "Common terms" here refers to existence, non-existence, likeness, unlikeness, sameness, difference, unity and number. ^ The creation of the universe is the creation of time: "For there were no days and nights and months and years ... but when he (God) constructed the heaven he created them also." — Timaeus, paragraph 37. For the creation God used "the pattern of the unchangeable," which is "that which is eternal." — paragraph 29. Therefore "eternal" – to aïdion, "the everlasting" – as applied to Form means atemporal. ^ Space answers to matter, the place-holder of form: "... and there is a third nature (besides Form and form), which is space (chōros), and is eternal (aei "always", certainly not atemporal), and admits not of destruction and provides a home for all created things ... we say of all existence that it must of necessity be in some place and occupy space ...." — Timaeus, paragraph 52. Some readers will have long since remembered that in Aristotle time and space are accidental forms. Plato does not make this distinction and concerns himself mainly with essential form. In Plato, if time and space were admitted to be form, time would be atemporal and space aspatial. ^ These terms produced with the English prefix a- are not ancient. For the usage refer to "a- (2)". Online Etymology Dictionary. They are however customary terms of modern metaphysics; for example, see Beck, Martha C. (1999). Plato's Self-Corrective Development of the Concepts of Soul, Form and Immortality in Three Arguments of the Phaedo. Edwin Mellon Press. p. 148. ISBN 0-7734-7950-3. and see Hawley, Dr. Katherine (2001). How Things Persist. Oxford: Clarendon Press. Chapter 1. ISBN 0-19-924913-X. ^ For example, Timaeus 28: "The work of the creator, whenever he looks to the unchangeable and fashions the form and nature of his work after an unchangeable pattern, must necessarily be made fair and perfect ...."
^ "No sensible man would insist that these things are as I have described them..." (Phd. 114d). ^ "there is no Platonic 'elsewhere', similar to the Christian 'elsewhere'." (Iris Murdoch, "Metaphysics as a Guide to Morals" (London, Chatto & Windus 1992) 399). ^ Cf. the Analogy of the Cave, Rep. 514a–520a. ^ The word is ethnos, "people". For the full range of meanings consult the American Heritage Dictionary online under ethnic. ^ Paragraph 399e line 5. ^ "Types" (genē) rather than the English economic classes or the favored populations of the real Greek cities. ^ Aristotle in Metaphysics Α987a.29–b.14 and Μ1078b9–32 says that Plato devised the Forms to answer a weakness in the doctrine of Heraclitus, who held that nothing exists, but everything is in a state of flow. If nothing exists then nothing can be known. It is possible that Plato took the Socratic search for definitions and extrapolated it into a distinct metaphysical theory. Little is known of the historical Socrates' own views, but the theory of Forms is likely a Platonic innovation. ^ The name is from Aristotle, who says in Metaphysics A.IX.990b.15: "(The argument) they call the third man." A summary of the argument and the quote from Aristotle can be found in the venerable Grote, George (1880). "Aristotle: Second Edition with Additions". London: John Murray: 559–60 note b. |contribution= ignored (help) (downloadable Google Books). Grote points out that Aristotle lifted this argument from the Parmenides of Plato; certainly, his words indicate the argument was already well-known under that name. ^ Analysis of the argument has been going on for quite a number of centuries now and some analyses are complex, technical and perhaps tedious for the general reader. Those who are interested in the more technical analyses can find more of a presentation in Hales, Steven D. (1991). "The Recurring Problem of the Third Man" (PDF). Auslegung. 17 (1): 67–80. and Durham, Michael (1997). "Two Men and the Third Man" (PDF). The Dualist: Undergraduate Journal of Philosophy (Stanford University). 4. ^ Plato to a large extent identifies what today is called insight with recollection: "whenever on seeing one thing you conceived another whether like or unlike, there must surely have been an act of recollection?" — Phaedo, paragraph 229. Thus geometric reasoning on the part of persons who know no geometry is not insight but is recollection. He does recognize insight: "... with a sudden flash there shines forth understanding about every problem ..." (with regard to "the course of scrutiny") — The Seventh Letter 344b. Unfortunately the hidden world can in no way be verified in this world and its otherworldness can only be a matter of speculation. Plato was aware of the problem: "How real existence is to be studied or discovered is, I suspect, beyond you and me." — Cratylus, paragraph 439. ^ Paragraph 50 a–c, Jowett translation. ^ a b Ross, Chapter XI, initial. ^ Book III Chapters 3–4, paragraphs 999a ff. ^ See "Chapter 28: Form" of The Great Ideas: A Synopticon of Great Books of the Western World (Vol. II). Encyclopædia Britannica (1952), pp. 536–541. Alican, Necip Fikri; Thesleff, Holger (2013). "Rethinking Plato's Forms". Arctos: Acta Philologica Fennica. 47: 11–47. ISSN 0570-734X. Alican, Necip Fikri (2014). "Rethought Forms: How Do They Work?". Arctos: Acta Philologica Fennica. 48: 25–55. ISSN 0570-734X. Cornford, Francis MacDonald (1957). Plato and Parmenides. New York: The Liberal Arts Press. Dancy, Russell (2004). Plato's Introduction of Forms. Cambridge: Cambridge University Press. ISBN 978-0-521037-18-1. Fine, Gail (1993). On Ideas: Aristotle's Criticism of Plato's Theory of Forms. Oxford: Oxford University Press. ISBN 978-0-198235-49-1. OCLC 191827006. Reviewed by Gerson, Lloyd P (1993). "Gail Fine, On Ideas. Aristotle's Criticism of Plato's Theory of Forms". Bryn Mawr Classical Review 04.05.25. Bryn Mawr Classical Review. Fine, Gail (2003). Plato on Knowledge and Forms: Selected Essays. Oxford: Clarendon Press. ISBN 978-0-199245-59-8. Patterson, Richard (1985). Image and Reality in Plato's Metaphysics. Indianapolis: Hackett Publishing Company. ISBN 978-0-915145-72-0. Rodziewicz, Artur (2012). IDEA AND FORM. ΙΔΕΑ ΚΑΙ ΕΙΔΟΣ. On the Foundations of the Philosophy of Plato and the Presocratics (IDEA I FORMA. ΙΔΕΑ ΚΑΙ ΕΙΔΟΣ. O fundamentach filozofii Platona i presokratyków). Wroclaw: WUWR. Ross, William David (1951). Plato's Theory of Ideas. Oxford: Clarendon Press. ISBN 978-0-837186-35-1. Thesleff, Holger (2009). Platonic Patterns: A Collection of Studies by Holger Thesleff. Las Vegas: Parmenides Publishing. ISBN 978-1-930972-29-2. Look up εἶδος in Wiktionary, the free dictionary. "Form" . Encyclopædia Britannica (11th ed.). 1911. Cohen, Marc (2006). "Theory of Forms". Philosophy 320: History of Ancient Philosophy. University of Washington Philosophy Department. "Lesson Three: Plato's Theory of Forms". International Catholic University. Ruggiero, Tim (July 2002). "Plato And The Theory of Forms". philosophical society.com. Philosophical Society.com. Silverman, Allan. "Plato's Middle Period Metaphysics and Epistemology". In Zalta, Edward N. (ed.). Stanford Encyclopedia of Philosophy.